The effectiveness of the underspin is something many touring pros have caught on to and Elite Bait Company took this proven tool and made it better. The Triple Shad Elite Underspin by Elite Bait Company provides the illusion of a small bait ball moving through the water column thanks to its three willow blades. A T-bar arm construction provides an ideal spread for the blades and offers a stabilizing effect while retrieved. 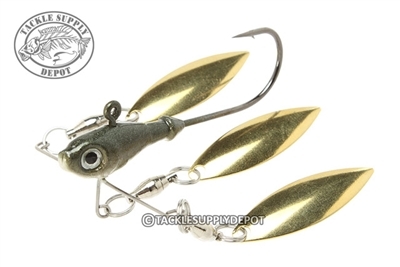 Match with a fluke style bait, grub or favorite swimbait tail, target the depth the fish are holding in and hold on.